I realized that I had a ton of coins on MyNintendo Rewards and they were all about to go to waste so it was time to make a move. I don’t buy digital games all that often, but when I do you can bet that they will be quality titles. 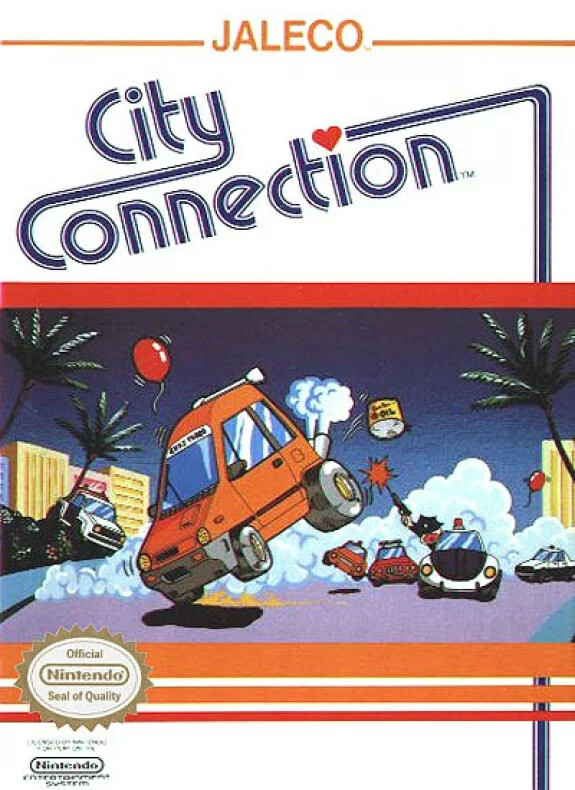 Well, City Connection isn’t all that good to be honest and it’s not very well known for a good reason, but the actual gameplay is fairly unique. With modern tech it probably could have even been very good. As it stands, the game is very forgettable and won’t be remembered as well as something like Mario or Legend of Zelda. The game starts you off right away as you drive through town. The levels are all on what is essentially 3 screens worth of ground to cover. You have to drive on everything to make the stage all white which clears the level. The stages typically have 3-4 levels of height to go through and you will have to dodge the cops and an evil cat as you do this. All you can do is drive back and forth as well as jumping. Once you master the controls you will also find that jumping and then changing directions is incredibly handy. The game is rather fast so it is very difficult not to bump into anything. One bump costs a life though so be careful as 3 bumps means that you are out. The game has roughly 5 levels before it starts looping back to the beginning forever and ever. There is no story or ending to be found so watch out or you’ll be playing old levels. I was nearly done with beating the game a second time before I realized this. It’s rather disheartening since it means that the game was really slapped together without a care in the world. I only made it through the game because of the save points that you can exploit with the Wii U. Prepare to save it every other second here as cars will teleport out of nowhere and the cat likes to move around as well. The cat is invincible so just don’t mess with him. He will chase you if you stay on any layer of the stage too long so do a lot of jumping. Of course, when you jump you are vulnerable as a car can easily jump out of nowhere to intercept you so watch out for that. You only counter to the cars is that you can fire back with some oil bullets. This won’t work on cars that teleport though so watch out for that as they aren’t fully materialized into this plane of existence. Again, I like the concept of having to paint a whole town. It’s sort of like De Blob, the execution just wasn’t on point. The Police Cars just seem unfair with how they teleport around and there is almost no way you can win without the extra save points. There isn’t any incentive to win either since the game has absolutely no replay value or even a real ending to congratulate you on a job well done. There isn’t much to say about the graphics either. They are just really old and I suppose you can’t fault the game for that. It’s all right I guess, but probably one of the worst animated games that I have seen in a while. The little screencaps after each level are okay if not for the fact that they reuse them very quickly. Those couldn’t have been very expensive so I think the game could have added many more of them. There is really only one theme in the game so you better enjoy it or that will hurt the game as well. It’s not bad, but there isn’t any real personality to the theme either so it’s just there. It’s kind of like elevator music in that respect. This game needs a modern reboot to help restart the franchise. Overall, I can’t say that the game is very fun. It’s unique and is good to play for a few minutes, but it’s not a game that I would recommend spending money on. It just isn’t worth that kind of attention and I’ve seen free games that had a lot more heart and depth to them. If you really want a good challenge then I guess this could be the ticket for you, but there are better options out there like Ninja Gaiden. I’d never heard of this game before I bought it and I can now see why. This entry was posted in 5 Star Games, Game Reviews, Games, Reviews and tagged Car, City Connection, Game Review, NES, Racing, Retro, Retro Review, Review, Video Game, Video Game Review by dreager1. Bookmark the permalink.